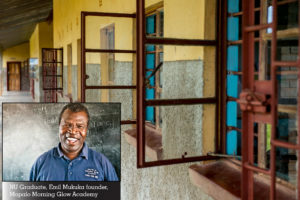 Mapalo Morning Glow Academy is community school for orphans that was started by one of Northrise’s graduates. Pastor Emil Mukuka started the school out of a heart to reach out to the vulnerable in society. Northrise encourages the efforts of Pastor Mukuka by offering financial and moral support for school building projects and the feeding program at the school. Today Emil feeds, clothes, and educates 300 children in his community. At age 17, Brian Musentekwa feels very blessed to be a student at Northrise. 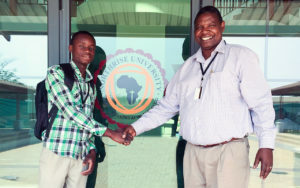 Progression beyond high school is limited for the majority of Zambian students and even more challenging for individuals in economic circumstances like Brian’s. Brian lives with his mum, dad and five siblings in Ndola’s Mapalo compound. His dad works a casual job at an air force base a little distance from their home. Their community is more of a derelict settlement on the western ends of the city. Consequently, Mapalo struggles with widespread economic deprivation, limited access to education, health and social facilities. The state of entrenched material, social and spiritual poverty moved Pastor Emil Mukuka, a Northrise University graduate, to establish a community school in Mapalo compound. Since inception, Mapalo Morning Glow Academy has worked with the local community to encourage parents and guardians to send their children to school. Mapalo focuses on a long-term holistic poverty alleviation strategy. Therefore, the academy fundraises to subsidize fees and a feeding program. Most of all, Mapalo provides spiritual guidance for the pupils. Brian Musentekwa, now an NU first year student, is a testimony of God’s blessing the interventional efforts of Mapalo Morning Glow Academy.